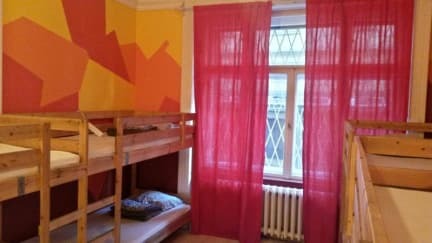 Oleander Hostel i Budapest, Ungarn: Bestill nå! We don&#39;t accept male groups bigger than 5. Be specific with your arrival time. Balance due to be paid in cash upon arrival. Parties are not allowed in our facilities. To ensure that the group will be quiet after 23 hours we will ask a caution deposit of 10 euro per person which will be returned at check out time. If the group breaks the hostel&#39;s rules staying in the common area overnight chatting or making noise or behaves bad without respect for the other fellow travelers or causes material damage to the property this caution will be not returned and the group will be asked to leave the hostel immediately without any refund. -Taxes are not included. This cost is 2 per person per night. -Due to security reasons, we do not accept bookings made by local citizens anymore. -We accept only female groups. If 5 or more males make a booking, it will be immediately canceled without any refund. 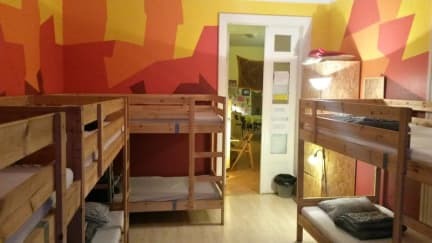 -Groups will have to pay a 10 € refundable deposit per person to ensure hostel&#39;s rules about being quiet at nights, avoiding material damages in the property and for the provided keys. If 6 or more males make a booking, it will be immediately canceled without any refund. - Ta flybussen (200) til siste stopp (Kobanya-kispest) og ta metroen til Ferenciek tere. - Fra Ferenciek tere snu 180 grader til venstre på toppen av rulletrappen, gå opp trappa og ta 90 grader til venstre fra brua. Gå oppover gaten til å nå Szep utca (første til høyre). Vi er husnummer 5. Skyv Bell. eller bare ta en Zona Taxi for 3600 forint. - Gå under jorden og ta den røde metrolinjen til Astoria. Ta rulletrapp opp og gå helt til venstre avkjørsel merket Kossuth Lajos ut. - Gå rett fram 100 meter for å nå Szep utca (den andre til venstre). Vi er husnummer 5. Skyv Bell. - Gå under jorden og ta den blå metro linje til Ferenciek tere. Fra Ferenciek tere snu 180 grader til venstre på toppen av rulletrappen, gå opp trappa og ta 90 grader til venstre fra brua. - Gå opp i gaten for å nå Szep utca (første til høyre). Vi er husnummer 5. Skyv Bell.